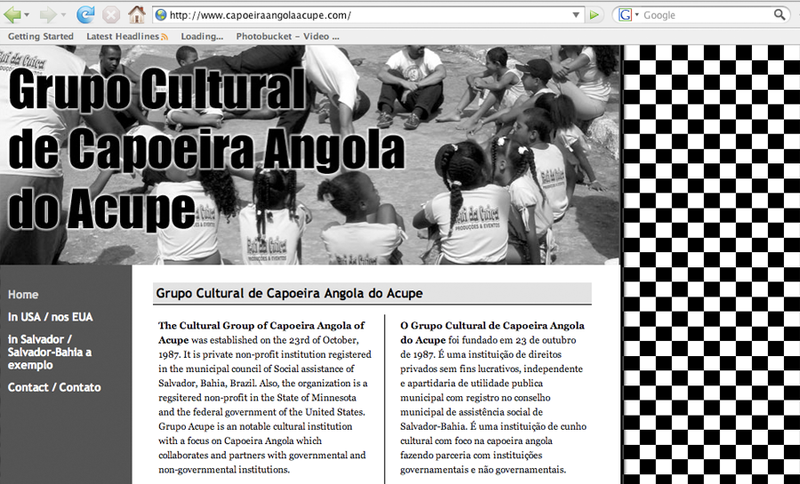 Built for a Capoeira group with branches in Minneapolis and Brazil, this site was bilingual. Working directly with the client, I designed and handcoded a simple site with basic information about the organization, and a contact form. Coded the front end of this site in strict xhtml based on PSD comps provided by graphic designer and wireframes provided by I.A. (.net server added additional code later). Site had to look good on IE6. CSS techniques included "sliding glass doors" and sprites. 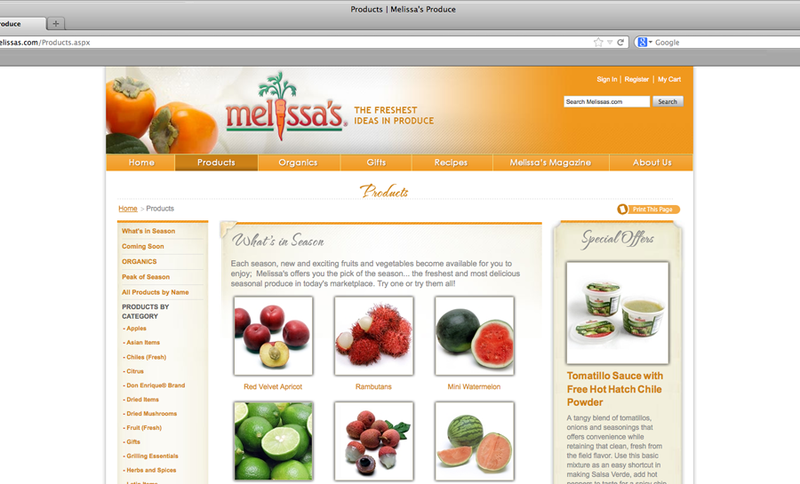 Whole site is still live at http://www.melissas.com. 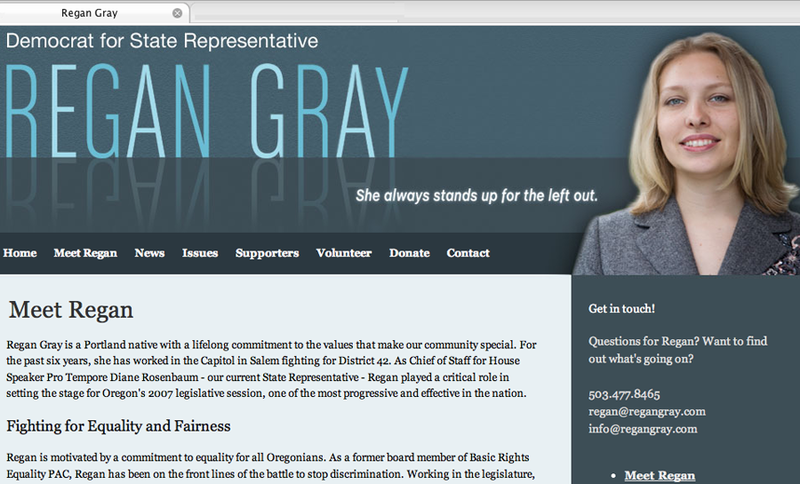 Worked with Ms. Gray's public relations representative to translate campaign materials into a campaign website. 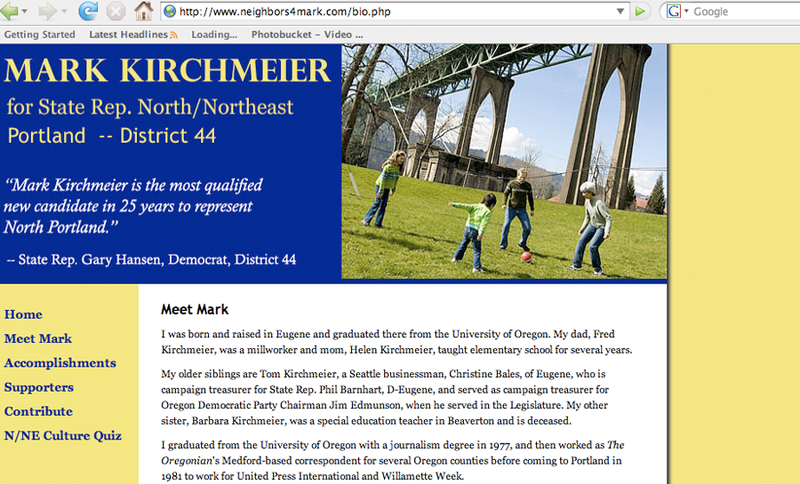 Worked with Mark to translate his campaign materials into a campaign website. I communicated with this client entirely by cell phone and email. 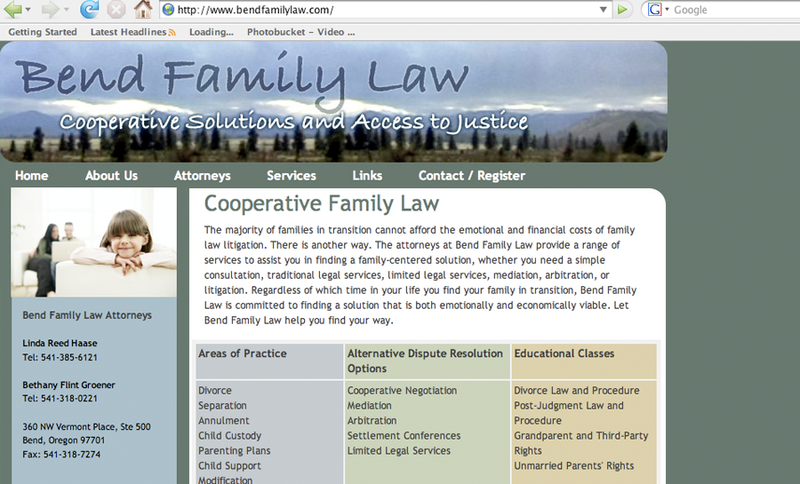 We worked together to create a local, family-friendly look and feel. The site was a hand-coded static site which included a contact form. Between 1999 and 2009 I had leadership positions in two professional development and networking groups for internet and web professionals. Portland Oregon Women on the Web (POWW) was a Portland-based networking group for women involved in web design and development. 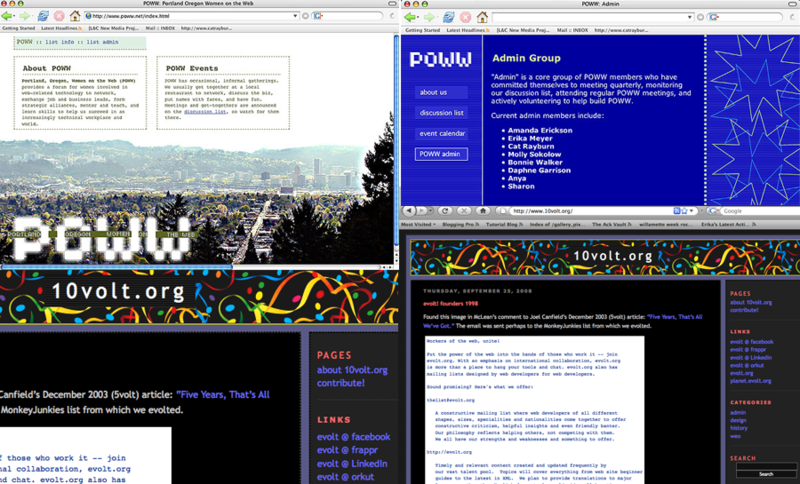 I created a minimalist site for POWW in 2002, and redesigned it in 2005 (archived here). I also helped maintain the group's discussion list. Evolt.org was an international group of web design and development professionals active from about 1998 to 2010. I was part of the list administration group, assisted in a website redesign effort, and published several articles on the website. In 2010 I designed a fun wordpress-based site around a reunion event ("10volt"). Handcoded site developed based on instruction from client, included a monthly show calendar. I took photographs of the club in order to develop graphics. 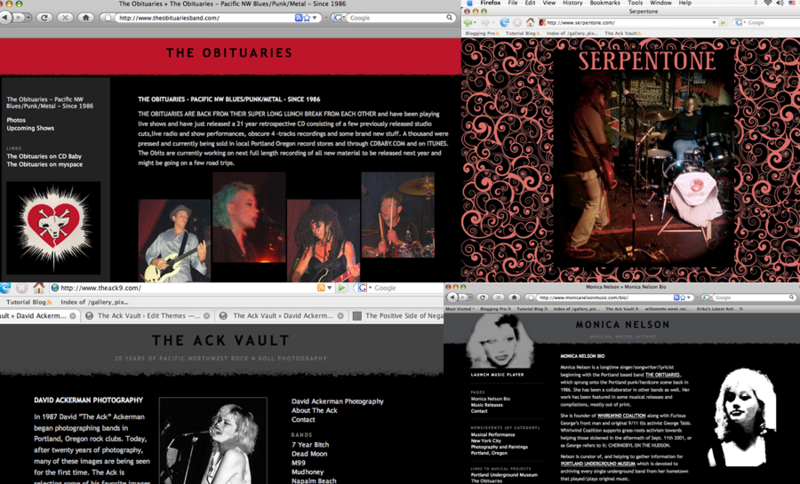 Over the years, I have made websites for painters, photographers, and musicians. In each case, I work with the client to determine his or her needs: a gallery, a music player, embedded feeds, links. Some of these sites have been static sites, some have been Wordpress-driven. 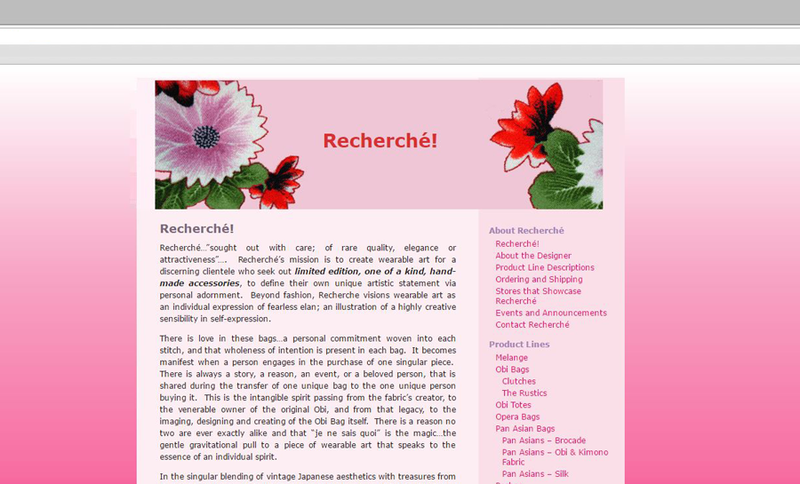 See http://www.theack9.com for an example of a wordpress-driven site which has helped the artist gain notoriety and sell photographs.